Functional art is the need of the day. With apartments getting smaller everyday, finding home space to showcase art has been severely limited. 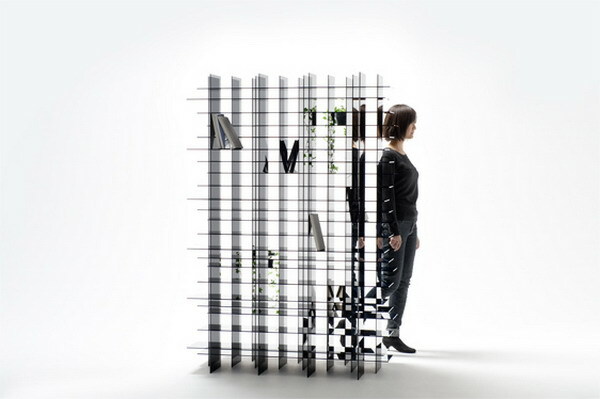 So it really is wonderful to see innovative designs like this great-looking bookshelf from Nendo. The Japanese design firm is known for its out-of-the-box design sensibilities and the Scatter Shelf is a testament to their signature style. The Scatter Shelf is a tall bookshelf that is a treat for the senses. The bookshelf features black acrylic shelves measuring 5mm in thickness. These are stacked in three layers, but in a somewhat haphazard manner. The end result offers an incredible visual appeal. Yet, there is nothing flimsy about the final product. The Scatter Shelf is somewhat inspired by a spiderâ€™s web. Thus, when you put books on to the shelf, they start to resemble insects caught in a web. The glossy acrylic shelves reflect off each other to create this almost illusory effect. From some angles, the entire structure looks transparent. As for the reflections, they create an impression that from different angles the bookshelf looks different. The kaleidoscopic effect makes this a stunning addition to the contemporary home. If you are looking for a piece of furniture that will prove a conversation piece, the Scatter Shelf is a great buy. Only, the bookshelf may not be up for sale yet. From what we know, Nendo will be busy doing showings of the Scatter Shelf in the coming days. Watch out for the display at Carpenters Workshop Gallery in London and during the Frieze Art Fair to be held in October.